To Fred in California, we do not have a phone number for you. #796 WA THIS GENTLY USED, LOW MILE, FRONT SLIDE WANDERLODGE HAS BEEN GARAGED AND IS IN EXCELLENT CONDITION INSIDE AND OUT! Coach is in great condition and has new engine batteries. 2000 LXI 43 with living room-galley slide coach has only 65,000 miles. 500 HP Series 60 Detroit with three stage Jacobs engine brake and Allison Six speed World transmission. 15KW Power Tech generator with auto start has approx. 300 hours. Coach is loaded with special options. Stainless steel package, roof rack and walk plate, solid surface entrance steps with brass grab handles, rear and side mount cameras/monitors, computerized HWH auto leveling jacks, digital satellite system, Bose stereo with Kenwood equalizer, Sirius satellite radio, Zip Dee awning package, outside bay entertainment center, Peninsula thermopane windows, two Trace 3000 watt inverters, Altimeter, three roof AC's with heat strips, and Detroit engine pro-driver readout. Coach has been garaged and stored securely for several years. Everything has been immaculately maintained at the storage facility. Owner has all receipts for storage, work, and items purchased for coach. Coach has never been smoked in and no pets. Pictures do not do justice to how clean and well maintained this coach is both inside and out. Recent Michelin 315.80R tires and recent batteries. EXTERIOR colors are black and copper over dark green with black, green, violet, and gold accent striping. Remote controlled chrome heated review mirrors. INTERIOR has living room-galley slide, brass toe kicks throughout, special triple tiered infinity design ceiling panels with mirrored inserts in living room and bedroom. Granite style Corian counter and table tops with dark green and brass edging. Six way power ISRI air ride pilot seat and power co-pilot seat are covered in Villa ultra-leather. Lower dash is ultra leather. Upper dash is black Vitricor. LIVING ROOM has oversized fabric sofa with drawer storage, ultra-leather Ekrones recliner with ottoman, Corian topped companion table, overhead 20" TV, recessed down spotter lighting, sculptured carpet. Windows have solid surface window sills and special coordinated valances with infinity shades. KITCHEN has Corian counter with dark green and brass inlay, brass pulls, molded Corian double bowl sink, brass Grohe faucet with brass Konstant hot, beveled mirror strips backsplash, acrylic wall divider, black front micro-convection oven, Norcold four door refrigerator with ice-maker, two burner electric range with ceramic cook top, and pull out pantries. Dining area has round front stemware cabinet, Corian topped dinette extension table with two chairs, kitchen style overhead cabinet and wall with beveled mirror strips. Diagonal laid tile flooring in kitchen, hall way, and bath areas. WALK THROUGH BATH has Corian topped vanity and sink, full face mirrored door medicine cabinet, stacked washer-dryer in double door cabinet behind toilet, large round front shower with seat and brass fixtures, and two double mirrored door wardrobes with drawer storage. Private toilet has lavatory and mirrored medicine cabinet. BEDROOM has laminate cabinetry, queen island bed with under bed storage, overhead cabinet, night stands, bedspread with coordinated window treatments, infinity shades, built in 20" TV above the sit down dressing vanity, and carpeting. 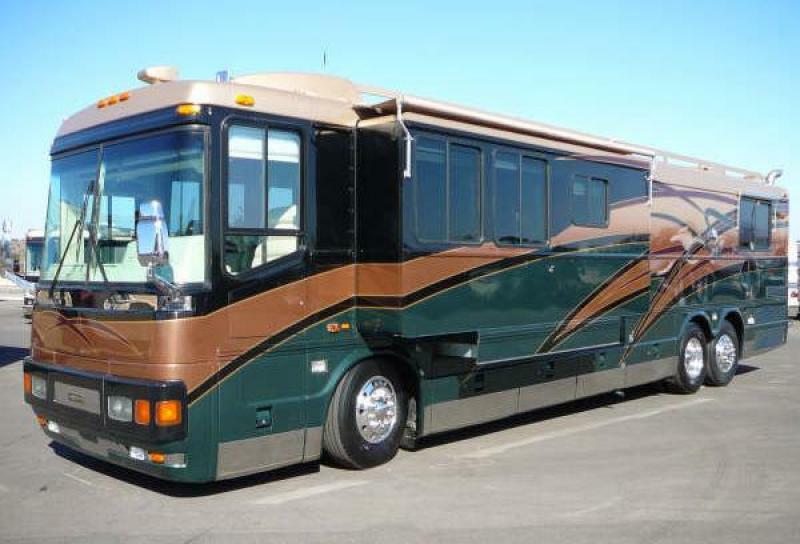 GENERAL This coach is loaded with special options including, keyless entry, security safe, air dump valves, power cord reel, cargo bay water cabinet, Aqua Hot heat system, and radar detector, three ducted roof AC units with heat strips, BBQ grill, and more.. This no pet, non-smoker coach is in excellent condition. Call 217-826-8907 for details.